"Al, can you hear me? Oh boy..."
Chelsea striker Fernando Torres has suffered for form since signing from Liverpool for a British record £50 million fee. Blues fans need worry no more though, as an explanation is at hand. Inside the Sheepskin has spoken to a hologram from the future called Admiral Al Calavicci who has stated that Torres’ current lameness in front of goal is down to his body being possessed by a time travelling quantum physicist called Sam Beckett. Beckett apparently “leaps” from subject to subject, from timezone to timezone, all in the bid to finally get “home” and back to his timeframe of early 1990s Hollywood. 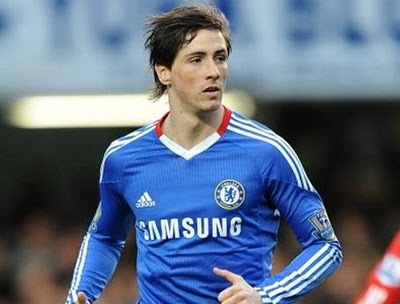 Al seemed pleased with Torres / Sam’s performance against Champions League minnows FC Copenhagen on Wednesday evening, stating that “you could tell that Sam has never kicked a ball in his life” and despite having the speed, power and agility of Torres’ body was still “the utter drizzling shits”. It is thought that the romantic subplot between Torres / Sam and an attractive trainee physiotherapist at the club who is tired of clumsy male advances will fail once Sam moves on and Torres resumes being a floppy haired, acne-scarred hit-and-hope spoiled rich kid.